Waukee Fire Chief Clint Robinson, fire fighter/paramedic Josh Hutton, fire inspector Justin Frederick & Waukee Police Sergeant Hector Arias. 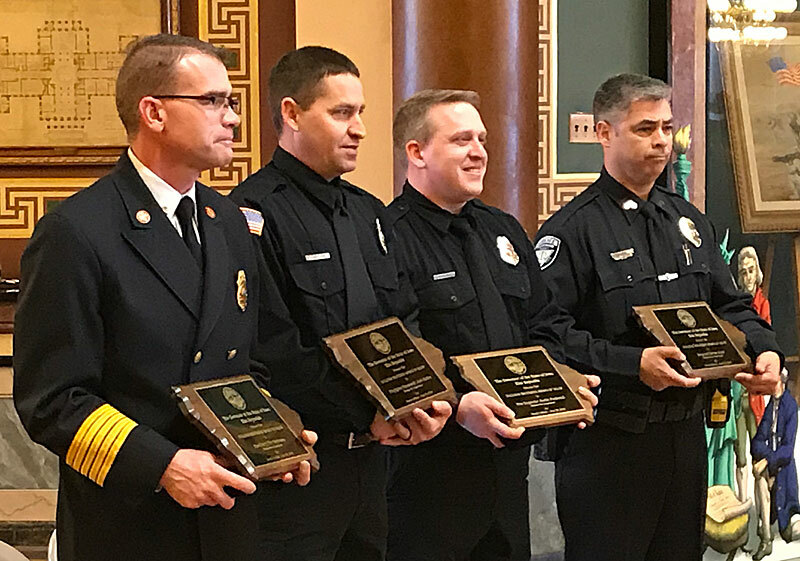 Four first responders from Waukee were honored today for their heroic efforts to rescue a woman from a submerged vehicle last June. The four men each received the 2018 Sullivan Award for Valor. Waukee Fire Chief Clint Robinson told reporters it was a bitter sweet event for him and the three others who received the recognition. “The award itself is obviously pretty humbling given the namesakes of it and then given fact that she didn’t survive certainly weighs heavily on all the responders,” Robinson said after a ceremony in the capitol rotunda. Robinson and two other members of Waukee’s fire department along with a police sergeant from Waukee took turns diving into a murky pond near a car dealership in Waukee. The group ultimately freed the woman trapped in a submerged P-T Cruiser that was not visible from the shore. She was taken to a hospital, but did not survive. Public Safety Commissioner Roxane Ryan and the Governor take a photo with the Sullivan Award honorees. 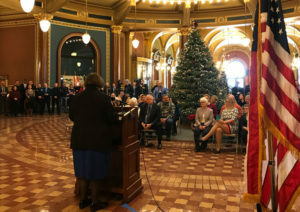 Iowa Department of Public Safety Commissioner Roxane Ryan said the four first responders had to work in the water without life vests or floatation devices, because none were available. “These four individuals, while serving in an official capacity, distinguished themselves by performing this heroic act in excess of demands of normal police or fire service, while fully aware of the threat to their own personal safety,” Ryan said. 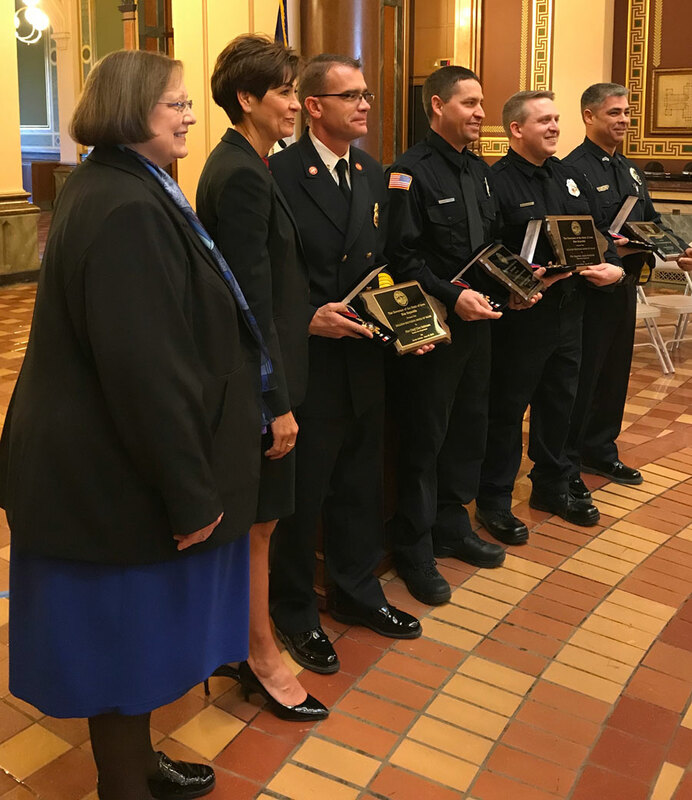 Governor Kim Reynolds paid tribute to the four men during a ceremony in the statehouse. DPS Commissioner Roxane Ryan presides over the ceremony. The Sullivan Brothers Award of Valor is named for the five Iowa brothers who served in World War II and died together when the U.S.S. Juneau was sunk in battle.